I live in a neighborhood that promotes a New Urbanist style of living. Our homes all have front porches designed to be at eye level with a person walking on the sidewalk, so it is easier to have a spontaneous conversation. 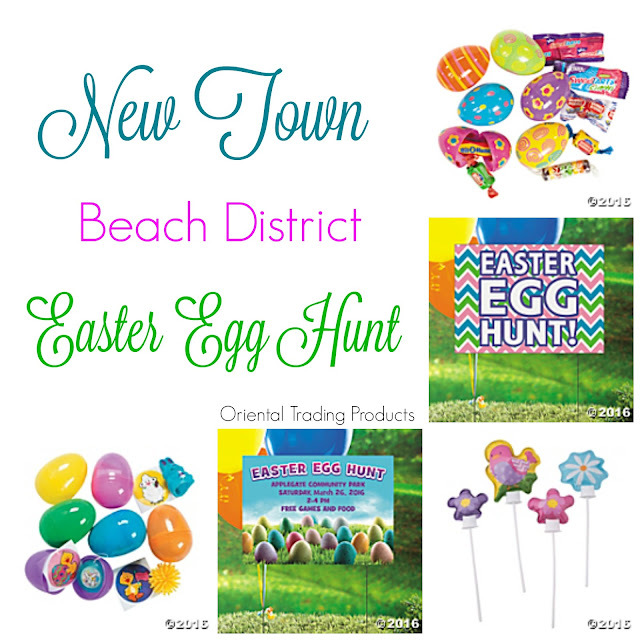 Our neighborhood is designed to have several districts, and ours, the Beach District, is one of the newest. We love our district! 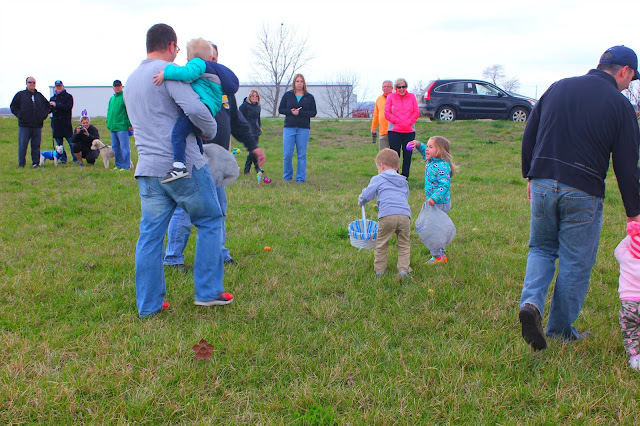 We had a successful Halloween block party last October and I wanted to continue that fun with an Easter Egg Hunt. I reached out to my favorite party planning website, Oriental Trading, and they agreed to give me some product in exchange for my honest review of their products. First I contacted my district to see if there was any interest. There were enough interested families to start planning. I decided on a date, time and place and again checked with my neighbors to see if this would work. It did, so the real planning began. 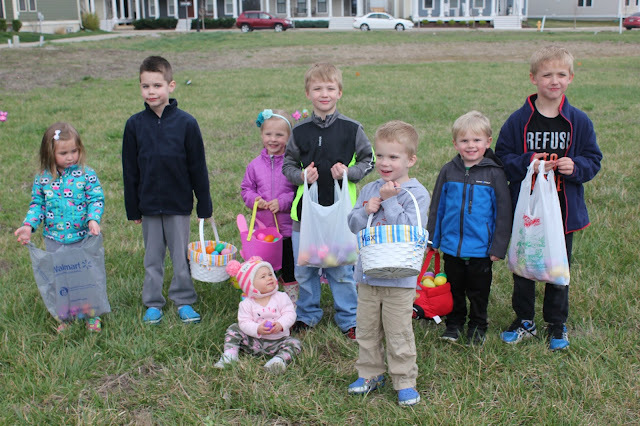 Next, we decided that each family would donate six filled eggs per child participating. Then I ordered several sets of filled eggs with Oriental Trading. The candy filled eggs were bright and cheerful. The candy inside was decent and all the kids seemed to like it. The toys were tiny but sweet and fun. Third, I asked one of my neighbors to be in charge of advertising. She made a darling flyer that went up in our mail center. We continued to keep families in the know using our Facebook page. We did not set up an "event" page but I would next year. Once the event was planned, I looked at what I could order from Oriental Trading. There are a lot of offerings, eggs, candy, jewelry, signs, balloons, and more! We ordered two signs: one vinyl that we can use next year to advertise the hunt and a paper one that, along with some self inflating balloons, made a darling photo spot. The signs were cute and easy to put together. The paper sign is a heavy duty cardstock. We'll get another year's use from it, and the vinyl one is strong with a metal frame. It will last for several years to come. We also ordered a large amount of pre-stuffed eggs. We wanted to be sure that all kids were welcome, even those that might be passing by. I was happy with all the products from Oriental Trading. Our Beach District kids were happy, too! The day before the event, I and some wonderful neighbors, scouted out the area where we wanted to have the hunt. We cleaned up trash and dog doo and marked out two areas: one for three and under, and one for four and older. The spray paint for marking grass would be perfect for this. I'm adding it to next year's list! The day of the event, my neighbors came back to help me distribute the eggs between the two groups. We found more trash and dog doo and cleaned it up. We set up the photo spot and set up the signage. When kids and parents arrived, we divided them into two groups. The younger group went first and boy, they were so adorable! 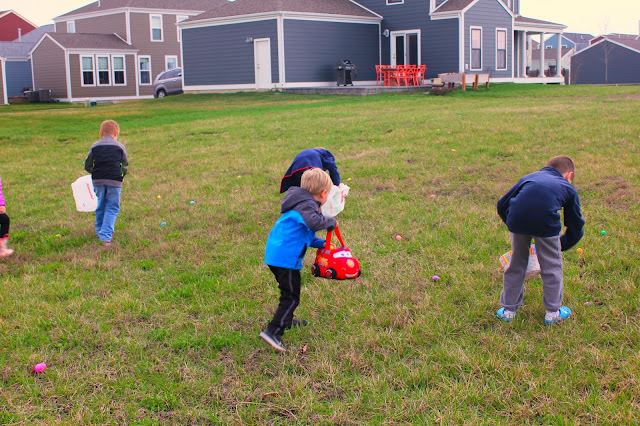 The older kids, having to wait, were now ready to find eggs! Off they went! We captured a group shot at the end, and all the kids went away happy! The event was a super easy event to plan, thanks to being able to order all our supplies at one location. We had more than enough eggs and each child took away many more than the six they donated! Our neighborhood in AZ hosted a hunt similar to this and it was truly wonderful Terri! Make sure you link this gem up on Thoughts of Home on Thursday. I also appreciate your kind comments about my spring home tour. 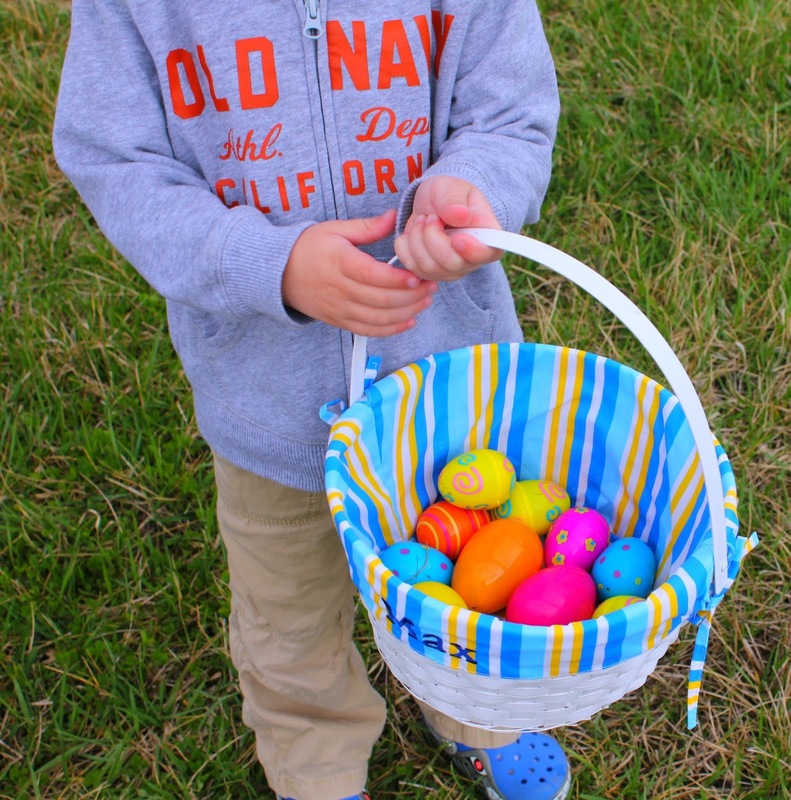 I love the idea of a community Easter egg hunt! What a great way to build a relationship with the neighbors. This looks like so much fun! I think organizing/hosting a hunt like that would be so fun to do! I searched you blog to see if I could find a picture of your house. I found one in your START HERE section. It was as I pictured in my head. I LOVE IT especially the front porch. I can see myself sitting out there waving at all the neighbors while relaxing. Sounds and looks like so much fun! My kids are all grown and out of the house and we live in a neighborhood with families whose children are all out of the house, too, so no little ones to do this with. Good planning ideas for other types of neighborhood gatherings though. So timely advice. Very helpful. Will try all these tips. You all totally made their day. What a cool thing to organize for the kids!